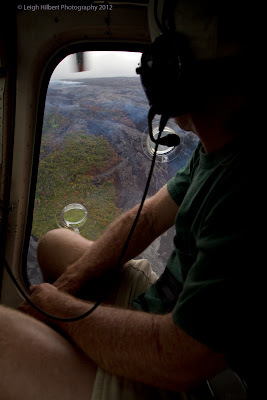 Mahalo Nua Loa to Paradise Helicopter management, staff and the pilots (Cal, Danny, Kalei, Macko and Joyce) who have been like a supportive ohana for Jack Thompson for some time. 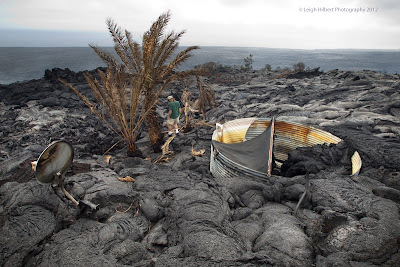 This has been particularly evident during Jack's challenging ordeal this past week with the massive lava flow that bore down into his Royal Gardens property - eventually decimating all that Jack had there. (Above: Jack spots his property) In one final gesture of their support, Paradise delivered Jack back to his land for his self-proclaimed last visit there, Saturday, March 10th, 2012. Jack's property was "Nearly 100% entombed" as Jack said, while standing next to a fragment of his roof that flapped in the wind as it protruded from the still smoldering lava-covered mounds. He stood where his comfortable home, surrounding rock walls and gardens were only one week earlier. As the photos show, parts of two lava-filled water catchment tanks, some roofing fragments, a few badly scorched trees, and a satellite dish were all that remained. 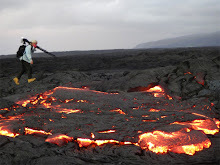 Jack said, "Well the catchment tanks still work - catchin' lava now". 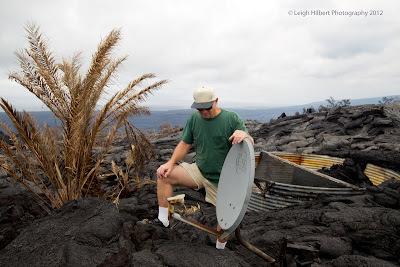 Jack joked wryly about having nothing left there now except TV-dish reception, adding cynically that the 'Dish Network' had previously cut-off his service because he was the only one in the entire area; and further, he was required to give them back the dish… Well they now know where they can find it. That sattelite-dish appears to be nearly sitting on the ground, yet it is still on a six-foot long metal post embedded in lava, revealing the average lava depth across his property. But it was the loss of the gardens he loved that hit Jack the hardest. (See a pre-lava image further down) He had planted hundreds of trees and shrubs, many of which were hand-grafted and trained to grow certain ways. 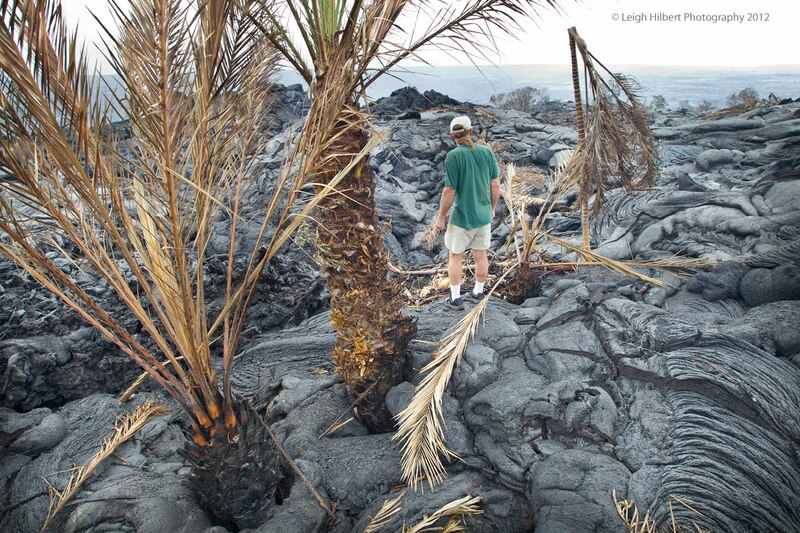 On Saturday, he wandered back and forth over the still hot, and in places molten & fuming lava, looking for any possible survivors amongst these plants he had spent years nurturing. There were very few. He found one of his mangos, a breadfruit, and an avocado tree, which he said, "May possibly survive by some miracle". 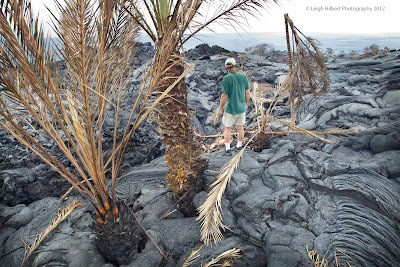 Those were at the one corner of his property the lava had not quite overtaken; the corner of what was once Plumeria and Hoku streets. In the middle of his land, just below the lava-filled water catchment tanks, he also spotted some of his air-orchids still alive and where he had planted them, tucked into the scalloped bark of a mostly roasted date palm. As he gingerly pulled back the bark and peaked in, he exclaimed, "Some of these might possibly make it!". One day I will hike up there and see if any of these beautiful orchids do brighten an otherwise lava wasteland. 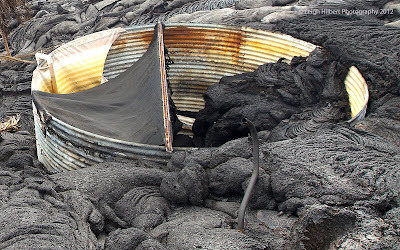 Jack had been feeding two semi-stray cats next to his house; they had been abandoned by neighbors burned out by lava years before, and were too wild to be picked up and taken with him during the evacuation. One of the last things I watched Jack do while we carried out his belongings to be airlifted last week, was place more food in the cat dishes across the yard from his house. 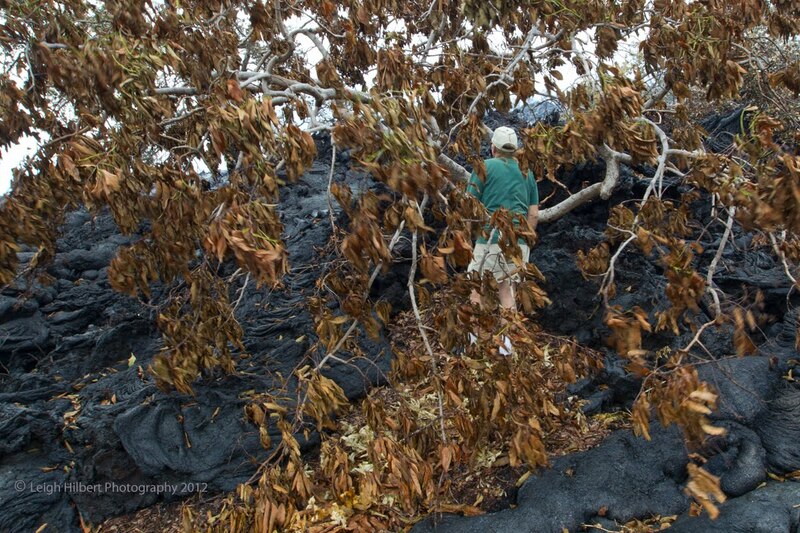 "They'll have to fend for themselves now" he said when the flowing lava was only 120 feet from the backyard. 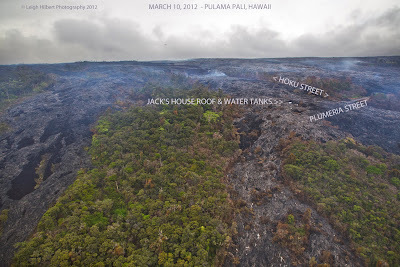 And while we walked the lava-swollen property Saturday, he mentioned the cats again. "They'll be okay - there's lots of stuff for them to eat out here", he said while gazing over the edge of the hot raw lava, to the remainder of the forest beyond. 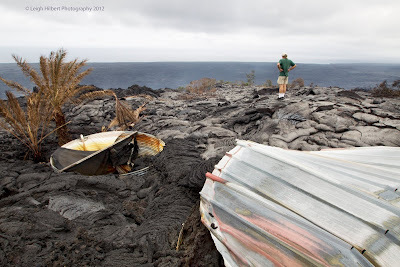 The only item that Jack took away from this last walkabout on his land was one burnt nail that the flowing lava had somehow lifted up and set on top of the new lava mounds. As he bent to pick it up he said, "Wow, it's still hot! ", and put the nail in his shirt pocket. 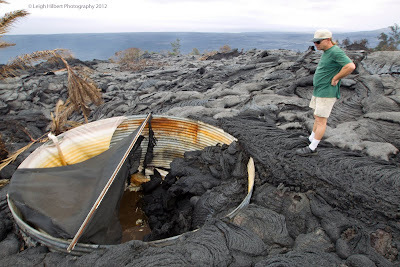 Above, Jack observes molten lava beneath the cooler pahoehoe. While you and I exchange gigabytes of information each week via our computers, Jack has never owned one. He has never sent an email. He tells me he did try once. 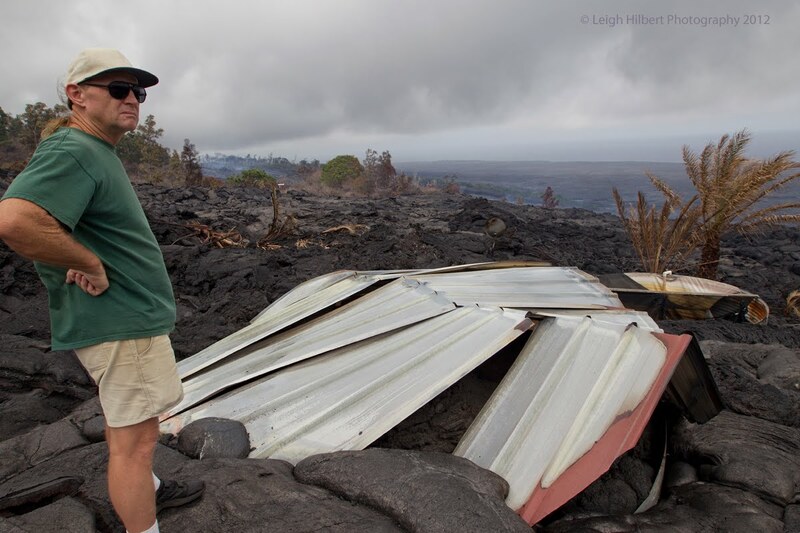 While down off his Lava House home and in civilization, he went to an internet cafe and tried for some time to write an email to a friend. Jack says he was nearly done writing when the email page disappeared. He got up and left and has not tried again. 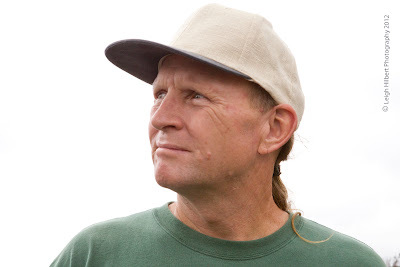 Jack is a soft-spoken man, measured in his delivery, which is short, direct, yet often rich in content. 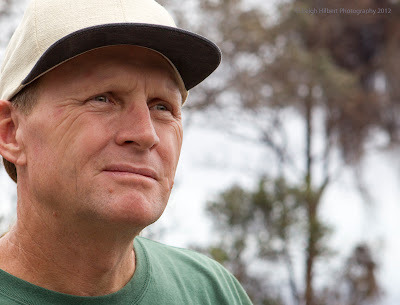 I have truly enjoyed sharing time with Jack, even while bearing witness to his final hours at his beautiful home, and being with him for his last look at what remains there. In the days before the lava came so close, he and I talked story, shared meals, watched two hours of TV dramas - something of a rarity for me since I don't have a television. Jack loves watching movies. 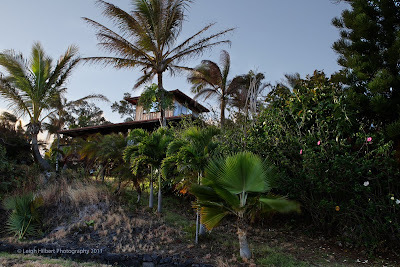 So much so, he would pack gallons of gasoline the three and a half miles from Kalapana Gardens across and up that inhospitable raw lavascape to his home high on the pali slopes. Though he had solar power, his giant TV needed a generator. One couple recently commented here on the blog that they were married at Jack's just weeks ago. 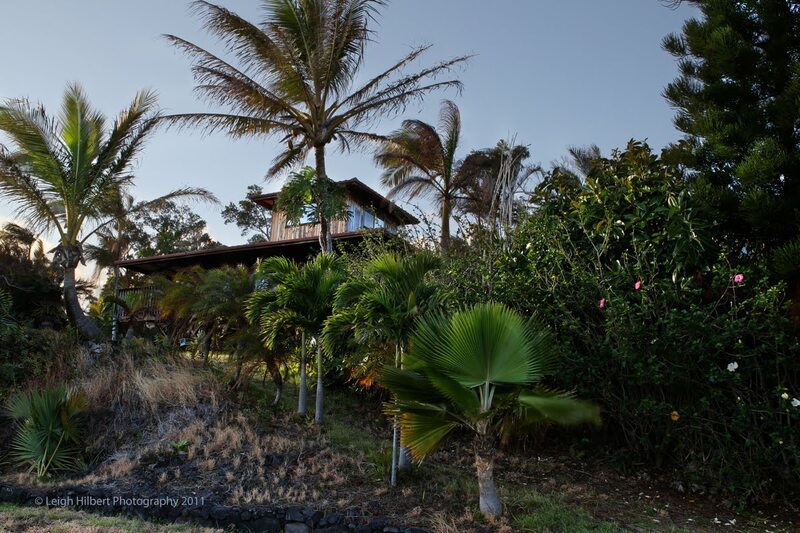 I mentioned this to Jack a few days ago and he said he was sorry they would not have a place to return to on his land for an anniversary, and that the mango tree they were wed under is gone. I bet the wedding was a great one though! 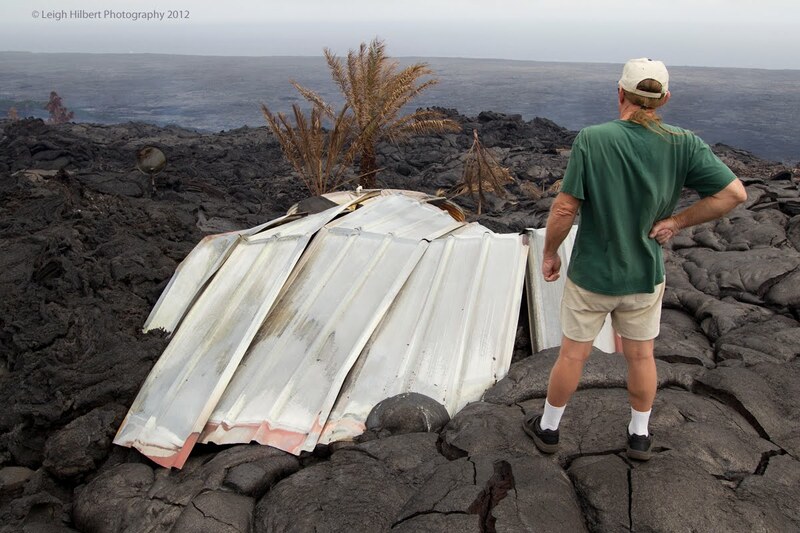 Jack's Lava House retreat was unique in all ways and created memories for many people over many years, and Jack enjoyed the visitors. NOTE added: HanaHou! 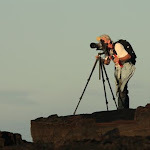 - the Hawaiian Airlines inflight magazine, published an article in their August/September 2012 edition and have a condensed version on their WEBSITE. My photos above are featured. This may be my last blog post for awhile. I do not plan to hike out to the current surface flows. I will be working on my movie projects. (Short update on that below). 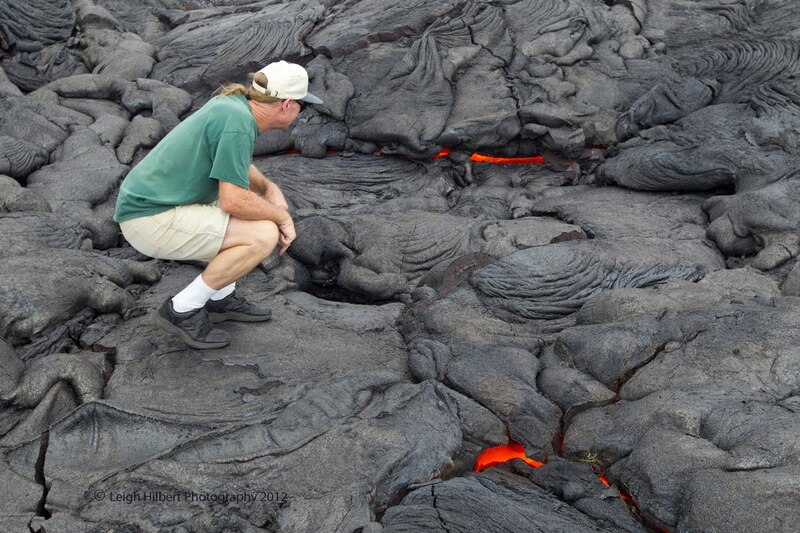 Lava is flowing along the coastal plains in several locations as it spreads out and rambles towards the sea, which is nearly two miles away but getting closer by the day. 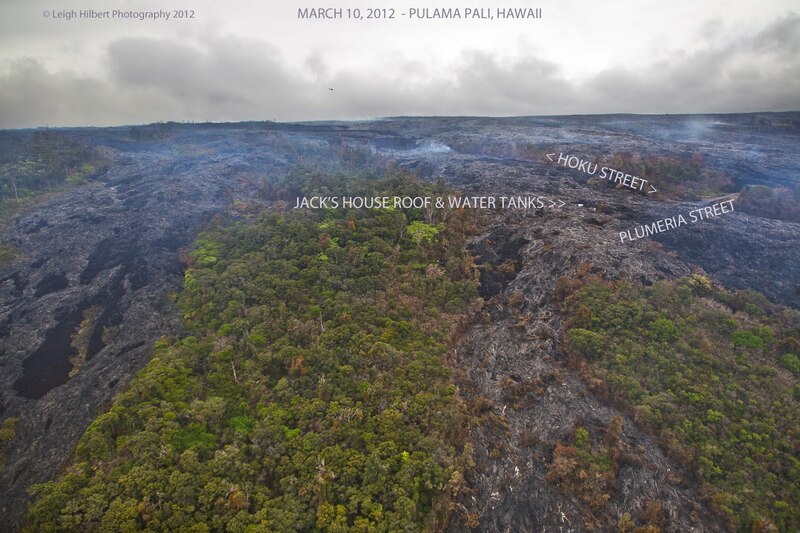 There are also numerous lava breakouts across a mile-wide area along and above the Pulama Pali. 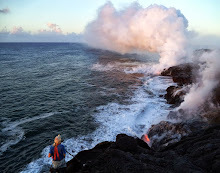 At night, lava glow spots can be viewed from the Hawaii County Civil Defense viewing area next to Kalapana Gardens, at the very end of highway 130-- open seven days a week from 2pm to about 9pm. There are also a few tour guides offering to take people out to the current surface flows. Ask the staff down at the viewing area for contacts. 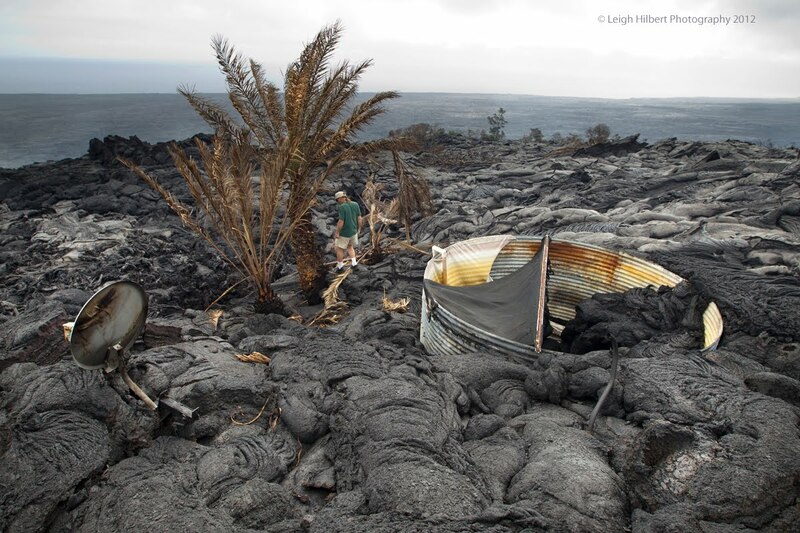 Lava Movie Supporters: Thank You!!! - Last pro-editing about to begin-- music licenses are still in process-- I might have to change the movies music to a lesser known composer to lesson the costs. My last reviewer of the short 33-minute version said, "It was the best thing I have watched in years!" -- That was good feedback I thought! 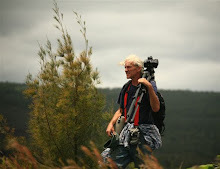 Leigh, best wishes on completing your documentary and I want to thank you for the updates you provided to all of us. Thanks for recording this. I just found the story and your footage. It's remarkable. As followup questions, I couldn't find anything recent about Mr. Thompson or the cats. Is he okay? What is he doing these days? And does anyone know if the cats survived? 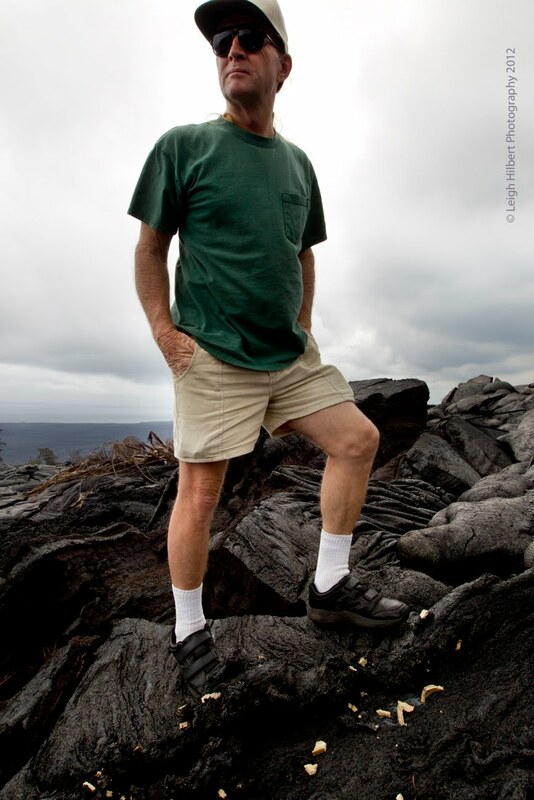 Jack is fine and living in Ainaloa, we never did find out if his cats survived, but Jack said they were half wild anyway and did well on there own in the past. I tried to talk him into going for a hike back up to his lot but he had no interest in doing that.